The March 3rd (First Saturday) Quimper Grange Square Dance is rolling around again. 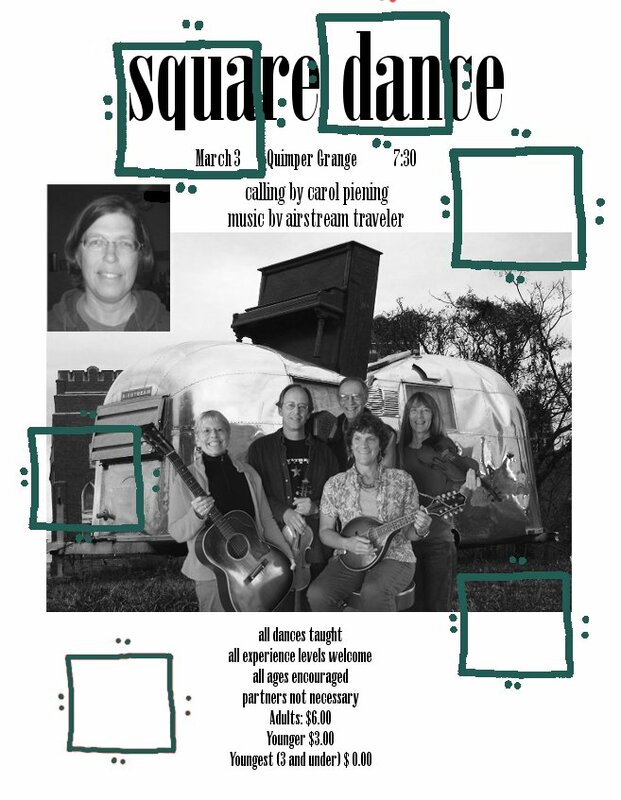 Tunes forthcoming from Airstream Traveler with calling by Carol Piening. Airstream Traveler has been playing for dances in Port Townsend for years and years. The band includes Gary Pascoe and Kim Thomson on fiddle, Carol Hardy on guitar, Roger Pick on concertina, and Libby Reid on mandolin. Carol Piening has been calling contras in the Olympia and surrounding area for a long time and has just recently starting calling squares! Look for traditional southern squares, mixed with quadrilles and possible New England square or two.